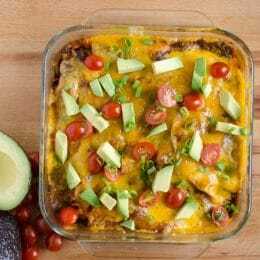 I LOVE all kinds of easy Tex-Mex meals and this Sweet Potato and Black Bean Enchilada recipe is one of our very favorites. It happens to be meatless, gluten free, and delicious too! I love the combination of the sweet potato cooked with bell peppers and savory spices. The sweet and savory is perfect together. 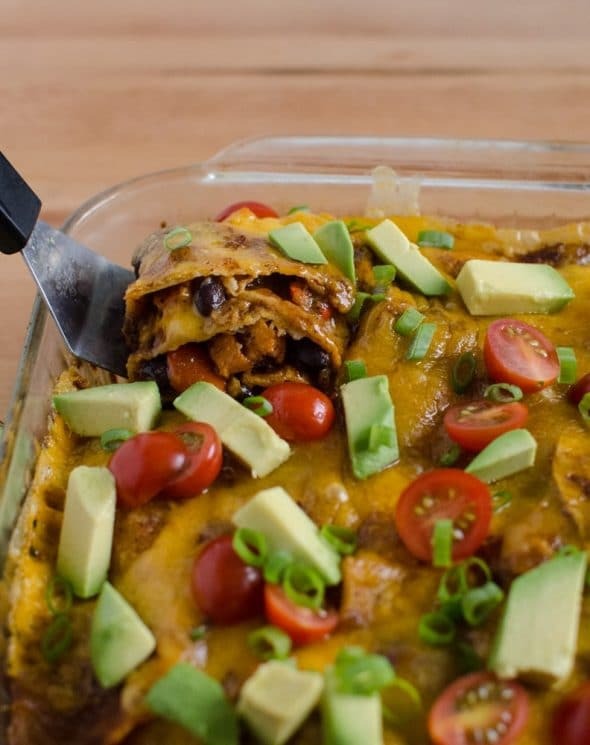 Instead of rolling the tortillas with the filling in the middle I like to simply stack everything in layers, hence the same “enchilada stack”. This is a little trick I have been doing for a few years now to save a little time in the kitchen. It cooks and slices up like a layered casserole or lasagna and everyone likes it; of course I don’t mind a little less work either. Roasting the sweet potatoes, onion, and bell peppers with spices and olive oil makes them soft, brings out more of their natural sweetness, and gives them a bit of smokiness, all of which is great in this dish. I love my homemade red enchilada sauce for a million reasons and I’d highly recommend trying it! One of the reasons I make enchiladas pretty seldom is because I never have the sauce! I started making homemade red enchilada sauce and homemade green enchilada sauce a few years ago and I’ve never gone back. Both recipes are super simple to make and they freeze great, so make a double batch to have on hand for later. 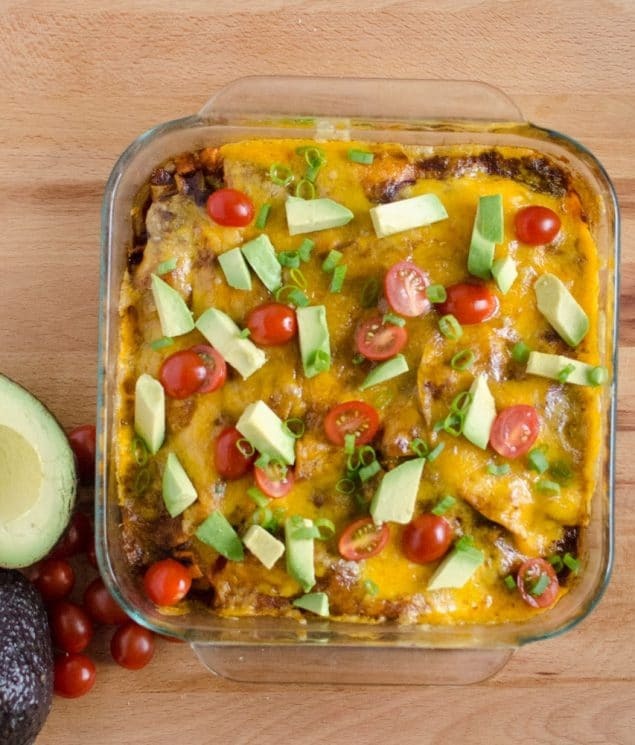 This dish is great with some fresh sliced avocado, tomatoes, cilantro, and even a little sour cream on top. You can serve it with just about anything but I’d highly recommend some fresh vegetables, lettuce, pico, or something along those lines on the side. You are going to love it! Melissa cooks, confesses, and corrals chickens and children at Bless this Mess, where you can find healthy recipes (with some simple desserts included), a peek at her hobby farm, and the joys of raising five little ones, eight years old and younger. She’s got a whole lot of mess to bless! In a small bowl combined the sweet potato, bell pepper, onion and olive oil. Stir to coat the vegetables lightly with the oil. Add the spices (chili powder through pepper). Stir to combine and coat the vegetables with the spices. Pour the prepared vegetables on a large rimmed baking sheet and spread them out so they are in one even layer. Roast until the sweet potatoes are tender 20-25 minutes. Remove from the oven. Reduce oven heat to 350 degree. Place the roasted vegetables back in the bowl and add the rinsed and drained black beans and the juice of one lime, stir to combine. In the bottom of the 9×9 inch baking dish add 1/2 cup of the red enchilada sauce. Add a single layer of corn tortillas (use about 2 tortillas) add 1/3 of the the sweet potato and bean mixture, then 1/4 of the cheese (about a 1/2 cup), and another 1/2 cups of red enchilada sauce. Repeat with more tortillas, sweet potato mixture, cheese, sauce. Repeat with more tortillas, sweet potato mixture, cheese, sauce. Add a final layer or corn tortilla, enchilada sauce, and then top the whole things off with a heavy hand of cheese. Cover the dish with aluminum foil and bake for 15 minutes. Remove the foil and bake for an additional 10 minutes. Let the dish cool for 5 minutes before serving with some chopped tomato, avocado, cilantro, and/or hot sauce on top. Do you have nutritional facts on this? My husband and I are on a low calorie diet. I’d love to try it if there weren’t too many calories. This recipe is yummyly healthy! 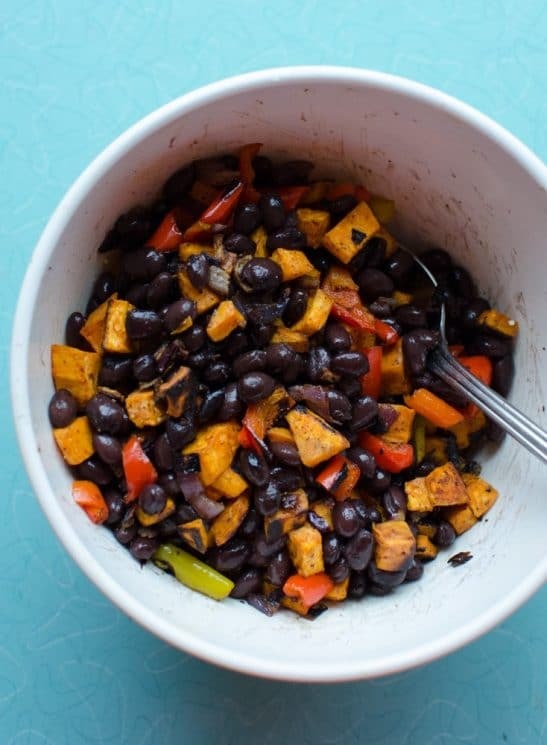 I’ve never liked the black beans, but since this recipe came with several other ingredients I tried this one! And it’s a must-try! We have just recently gone vegetarian, and this recipe has given me hope that it will stick. It was delicious! Everyone in my family loved it! And it was healthy! We didn’t miss the meat at all. Thanks for sharing it! I love this recipe!! I’m about ready to do a freezer meal party, and I’m wondering if and how you would go about making this freezer friendly! Thank you Melissa, my husband and I love these! Taste is great and love that it’s inexpensive and another meatless night.